The through conduit gate valve has been developed to satisfy the need for a high quality, high specification valve which is reliable and reasonably priced. The valve is robust, easy to maintain, conforms to international design requirements and quality assurance program. The gate valve conforms to all aspects stated in API 6A Standard. The gate valve is ideally suited to provide our customers many proven operating features in a product that is focused on meeting the requirements of low & high pressure applications. Commonly used for both wellhead annulus outlets and production trees, this gate valve meets industry standards and does not compromise on strength or seal integrity. The Gate Valve is ideally suited to provide our customers many proven operating features in a product that is focused on meeting the requirements of lower &higher pressure applications. 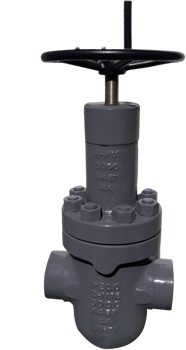 Commonly used for both wellhead annulus outlets and production trees, this gate valve meets industry standards and does not compromise on strength or seal integrity. API 6A check valves are used to prohibit the reverse flow in oil and gas pipelines. In order to suit various conditions of temperature and pressure PECO check valves are in wide materials. 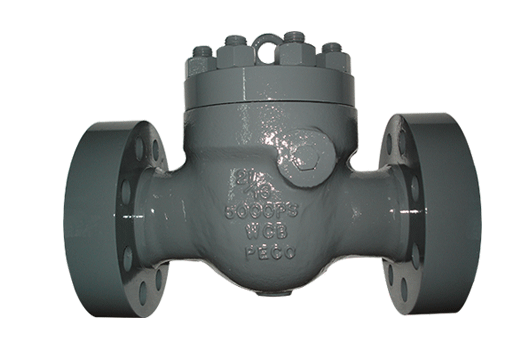 PECO Swing Check Valves are of full bore design which enables to go through the process of pigging or hot tapping. We provide API 6A check valves in bolted cover with heavy duty bolts, mounted disc and renewable seat.